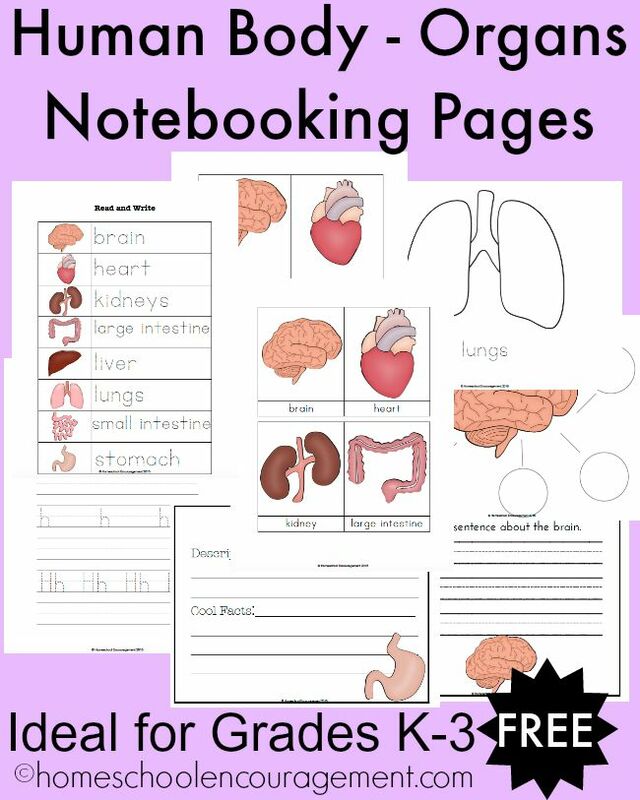 This FREE set of Human Body-Organs Notebooking Pages is one of my favorites! It is perfect to use with kiddos in grades K-3, because there are so many different pages to choose from. 3-part cards: These cards will help your children learn the names of the different organs. There are two sets. If you need tips for using the 3-part cards, visit this site. Coloring pages: Each coloring page has one large image of a body organ and a tracing label. Description pages: Each page has an image of an organ on it. You will also find circles for writing descriptions of each organ. Kids can write the organ’s job or describing words in each circle. Handwriting pages: I liked having themed handwriting pages when my kids were younger. There is one page for each body organ. Read and write: This is a page with an image of each body organ and a tracing word. Cool facts: Students write a brief description of the organ’s job, and then they can write down some cool facts about each. Sentences: As an alternative to the cool facts pages, younger students can write a sentence about each organ on these lined pages.